Freemasonry is one of the world's oldest and largest fraternal organisations: seeking to make good men better by teaching and encouraging trust, fellowship and charity. As an organization and as individuals, Freemasons strive to do charitable work within our membership and for society. To that end, the St Mark's Building Society, a non-profit organization, owns a 21 suite building (St Mark's Manor) and provides subsidized housing to low income senior citizens. If anyone browsing this web site is not a Mason and would like to know more, please feel free to contact us (or a Lodge in your area) and let us (or them) know you are interested in becoming a Mason. You may even see a vehicle in your neighbourhood with a Masonic sticker, we encourage you to introduce yourself to the driver - most Masons love to talk. If you are a Brother browsing this web site, welcome! If you have not been to Lodge for awhile, please do make an effort, we will welcome you back and make you feel at home. Please enjoy your visit to our website. We hope to meet you soon! Copyright © 2014. 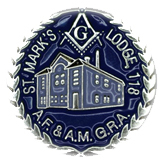 St Marks Masonic Lodge # 118. All Rights Reserved.